Max the pit bull was facing a death sentence. For attacking a vet technician in January, and then attacking another person in March, Max had fallen victim to the two strikes, you’re out law that governs vicious dogs. In spite of his owner’s pleas, Max was given the death penalty, having lost his final appeal on Tuesday. However, the next morning, Max was gone, rescued from his trip to the afterlife after someone broke into the animal shelter and stole the dangerous dog. 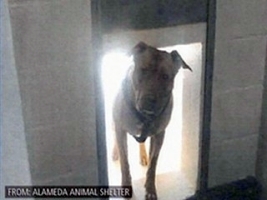 Sometime early morning Wednesday, between 4:30 and 7:30 AM, Max was liberated from the canine prison wing at Alameda, California’s Alameda Animal Shelter. Police are investigating the break-in, and are questioning the dog’s owners and people who have had contact with the dog since, well, who else would steal a 70-pound pit bull who loves to attack strangers? They’d be the first and only suspects on my list, too! Obviously, Max was framed. His escape from jail? The A-Team did it. B.A. needed a new buddy, and who better to have pity on than some fool pit bull who responds to jibba-jabba with violence?